Risks of more asthma attacks expected as climate continues warming. NRDC expert panel offers medical warnings and suggests precautions. If you have asthma, or know someone who does, heads up. Longer and hotter summers, associated with continued climate change, are creating hotspots of bad air across the nation, where smog and pollen combine to make life miserable, and for some life-threatening, for millions of Americans. Even if asthma doesn’t touch your life, polluted air can make you sick. And late summer and early fall is high season for unhealthy air in areas home to nearly 127 million people from Maine to Southern California. That’s the word from the Natural Resources Defense Council (NRDC), a highly respected 47-year-old environmental nonprofit organization. NRDC in this case assembled a team of physicians and public heath professionals to discuss a new map of dirty air hotspots around the United States, county by county. The mapping project, which Knowlton led, is an update from one released in 2015. It highlights places susceptible to elevated levels of ground-level ozone and also to ragweed pollen. Why ragweed pollen? It turns out that most cases of hay fever are caused by allergies to ragweed. Also, ragweed pollen peaks at the same time as elevated ozone, in the late summer and early fall. The “double-whammy” is worsening an existing and persistent public health problem. Ground-level ozone, meanwhile, can also hurt the healthiest among us. “Climate warming makes ozone pollution worse because ozone forms faster at higher temperatures,” said Dr. Patrick Kinney, a professor of urban health at Boston University’s School of Public Health. Ozone, Kinney said, can burn the lining of our lungs. Children playing outdoors are especially vulnerable. Asthma is a disease of the lungs, and it “causes repeated episodes of wheezing, breathlessness, chest tightness, and nighttime or early morning coughing,” as described by the Centers for Disease Control in Atlanta. More than twenty-four million Americans (nearly 18.5 million adults and 6.1 million children) suffer from asthma, according to 2015 data from the CDC – the most recent available. That’s nearly 8 percent of the total U.S. population. Particularly vulnerable populations include children 5-19 years old (about one in ten), black children (13.4 percent), and Puerto Rican children (13.9 percent). Asthma also disproportionately afflicts the poor. About 5 million, or 11 percent, of Americans living below 100 percent of the poverty level suffer from asthma. Nearly half of the 24 million Americans with asthma in 2015 reported having at least one asthma attack over the past year. In-patient discharges in 2010 totaled nearly 440,000. In 2015, more than 3,600 people died from asthma – including 219 children and 3,396 adults. Sheffield said one of her patients, a female high school athlete, suffered an asthma attack that led to multiple missed days of school and lost practice time. “For her, essentially we were able to control her symptoms, but I’ve had patients who were not so lucky,” she said. The new air quality maps color-code counties across the nation according to whether they are vulnerable to unhealthy smog days (shaded in red), ragweed (shaded in green) pollen, or both (shaded in brown). Click a county, and the population is displayed. Data are also given for each state. In California, for example, NRDC has ranked the state 18th in the percentage of people who live with ragweed and unhealthy smog days. Meanwhile, 42 percent of Californians live in counties with both ragweed and unhealthy smog days. Statewide, 2.3 million adults and 652,000 children suffer from asthma. The California page, as an example, also offers statistics on the number of counties affected by smog and ragweed pollen, describes how cutting carbon pollution can lead to reductions of $477 million in health costs by 2020, and how efforts to cut carbon pollution have led to an 8.1 percent decline in emissions from 2005 to 2014. What state ranks first in the percentage of people who live in counties with both ragweed and unhealthy smog days? Connecticut, where 97 percent of residents live in counties with both. Nearly 300,000 adults and 90,000 children suffer from asthma in Connecticut. If you’re looking for the most pristine air in America, head north to Alaska, where no residents have to contend with unhealthy smog days or ragweed pollen. The state is on borrowed time, however. The rise in average temperatures there has exceeded the global average, with a 2.5 degree Fahrenheit increase since the 1970s. By 2100, average temperatures could jump 17 degrees above historical records if carbon emissions continue to rise unabated – opening the door to smog and boosting the production of pollen. Even today in Alaska, 16,000 children and 51,000 adults suffer from asthma. Between those extremes, the NRDC mapping project reveals several particularly vulnerable regions, including many parts of the Northeast; Maryland, Washington, D.C., and Virginia; states around the Great Lakes; and Colorado, Utah, Arizona and California in the West. Cutting carbon pollution is paramount, participants in a recent NRDC panel said. But there are also steps physicians and other public health workers can take. “The climate is changing, and doctors need to pay attention to the pollen season and sometimes adjust the advice they give about when their patients should start controlling their medications,” Sheffield said. 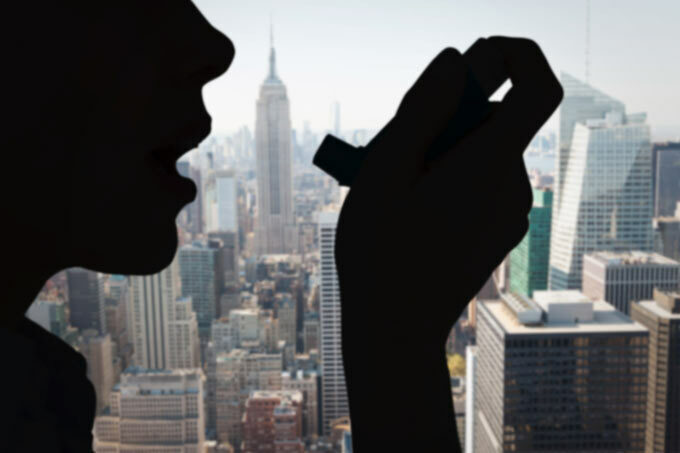 Dr. Judith Flores, chairwoman of the National Hispanic Medical Association and a pediatrician and medical school professor in New York City, said raising awareness among asthma sufferers and physicians who treat them is critical. Physicians, for example, can be more proactive in helping their patients be more cautious during seasons when pollen and ozone is at its worst. Schools can also help raise awareness among children and their parents. Knowlton added that state initiatives to reduce regional carbon pollution also help cut localized smog and the ozone dangers that come with it. Even simple steps such as laundering your clothes, running a wet wash cloth through your hair when you get home, and keeping your pets clean can help reduce the amount of pollen that finds its way into your home, she said. The panelists cited valuable resources to help people keep track of dangerous pollen and smog days. They include an EPA website that forecasts Air Quality Index (AQI) trouble spots for smog around the country everyday. Another resource is the American Academy of Allergy, Asthma & Immunology, which charts pollen and spore levels at its National Allergy Bureau webpage. Armed with information on air quality in real time, people can adjust their activity and protect themselves, Knowlton said.